If you are bothered by excess fat deposits, located on your face or body that do not respond to diet or exercise, liposuction may be an option to consider. Liposuction is a surgical procedure that is designed to slim and reshape specific areas of the body where there are deposits of fat that may be out of proportion to the rest of the body on men and women. There are several different techniques used in liposuction, including tumescent technique, power assisted liposuction and ultrasound assisted liposuction. Different areas of the body will require the use of these different tools. At your initial consultation, Dr. Barber will discuss in detail which technique is best for you and outline results that can be expected. Liposuction is not a weight loss procedure. Optimal candidates for this surgery include those who are close to their ideal body weight with abnormal collections of fat that appears out of proportion to the rest of the body. These areas can include the neck, upper arms, abdomen, hips, waist, inner and outer thighs and the knees. The incisions for the surgery are very small and are often hidden from direct view. Dr. Barber typically preforms the liposuction procedure at an outpatient surgical facility under general anesthesia. The length of the procedure depends on the area or areas being treated. Dr. Barber will go into more detail about the length of surgery during consultation. The average patient is back to work within 7-10 days and can resume unrestricted activity, such as exercise, in 3 weeks. 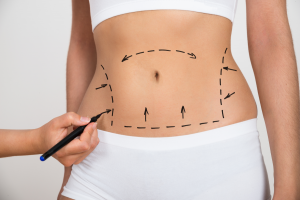 If you’re considering Liposuction, please contact our office at 336-275-3430 or click here to contact us online in order to schedule a private consultation with Dr. Barber today.